Sales can be a messy business: between leads, pending deals, different types of relationships, contracts, notes, and contacts to keep track of, it’s easy to find yourself always wondering where a certain piece of information is. That’s why A. Duie Pyle, a leading transportation provider, reached out to Simplus for help with their sales process. A. Duie Pyle wanted to have one place where all sales information was easily accessible and clearly stored, as well as better organized for more reliable reporting. Simplus’ implementation and advisory services stepped in to ease these pains. 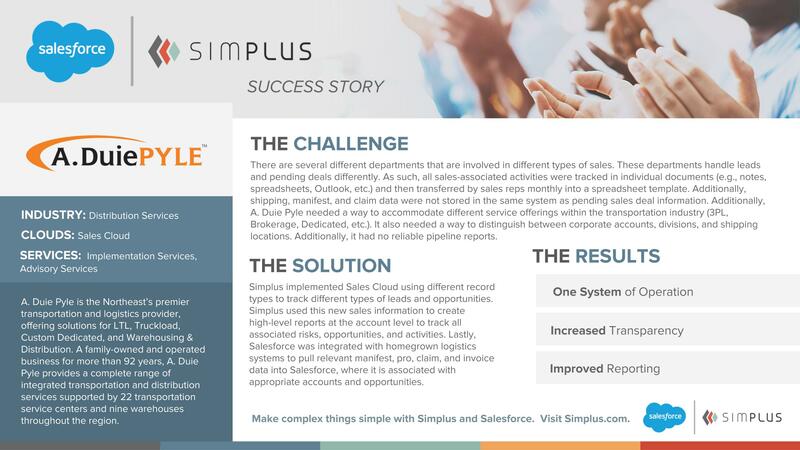 After implementing Sales Cloud at A. Duie Pyle, Simplus made sure the org leveraged different record types to accurately track the different types of leads and opportunities A. Duie Pyle had. This led to high-level reports and better tracking of accounts. We also integrated Salesforce with other systems at A. Duie Pyle to ensure all relevant data was also found in Salesforce and associated with the proper accounts. Ultimately, this meant A. Duie Pyle had better transparency, reporting, and data—all thanks to one source of truth in Sales Cloud.